Russia’s prime minister has seemingly become the face of grass as it is claimed his image has been found on a packet of seeds, that is now causing a growing stir on the internet. A photo of the packet, called “Putinskaya grass” was uploaded onto a blogger’s web page. The woman claimed she came across the seeds in one of the capital’s malls. 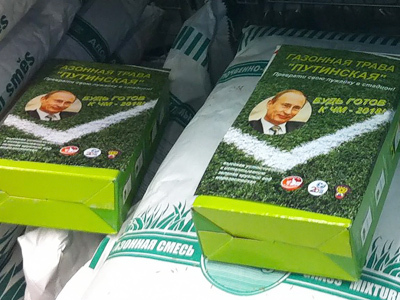 On the packet, under Vladimir Putin’s smiling face, was a call to “get ready for World Cup 2018 and make your garden look like a stadium”. The prime minister is believed to have played a crucial role in Russia being chosen to host the event, which was announced on December 2. While some believe sharp-witted businessmen designed the packet to cash in on Russia’s victory, others think that the blog picture is a fake. "The author perhaps printed a picture and put it on the box, and then took a photo,” writes one internet user. Even though it could be just a joke, analysts say that it perhaps signals a potential trend of business-minded people trying to profit from Russia becoming the 2018 World Cup host country, according to ‘Novye Izvestia’ newspaper. Business projects have already been launched based on FIFA’s decision and are expected to develop fast. You can already buy T-shirts, bags and mugs with “Ready to inspire” – the main slogan of Russia’s bid.